Believing the French armies were tied down in Spain, Archduke Charles advanced into Bavaria, intent on destroying the French army. The invasion caught Napoleon by surprise, but Charles’s advance was slow and it gave the Emperor time to react. 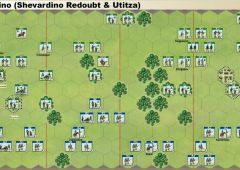 Davout’s isolated III Corps was marching to link up with the Bavarians, and Charles planned to destroy it first by massing three of his corps against it. As events transpired, on 19 April, Saint-Hilaire’s division encountered elements of a single Austrian Corps around Hausen. 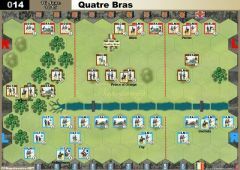 Davout immediately ordered an attack on the Austrians that had taken a defensive position on a series of ridges. 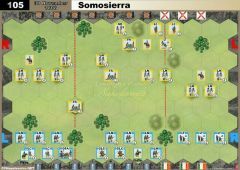 Although the initial assault failed, reinforcements arrived and the attack was renewed. The Austrians counter attacked the French after they had gained control of the first ridge, but the attack collapsed. 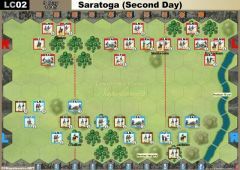 More troops were fed into the fight from both sides. The French finally gained the upper hand with the arrival of Friant’s division and the French artillery. The other Austrian corps in the vicinity did not march to the sound of the guns, giving Davout the victory. A very tense and closely-fought battle. The French had very good cards throughout. 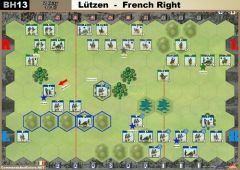 The Austrians started with stunning dice rolls, which were evened out by the end, and they were plagued by a weak selection of cards for large portions of the battle. 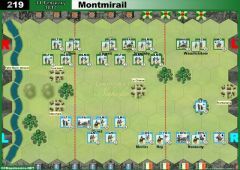 Following this debacle, the French fell back and regrouped on their right, while pushing a few units forward on the opposite flank. 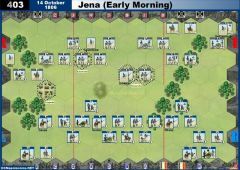 The Austrians likewise spent the time maneuvering units into place. 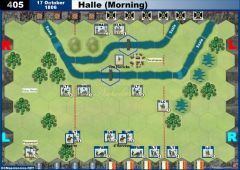 A lull ensued on the French right, while the Austrians attacked the French left. 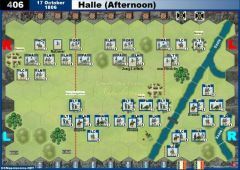 The French held their ground as their comrades deployed further forward in the centre. 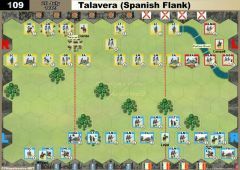 A blunder by the French general (who forgot that Horse Artilley cannot fire after moving when reduced to one block!) meant that the valiant French Horse Artillery was destroyed. The French managed to avenge their fallen comrades by finishing off an Austrian Line Infantry unit that had been subjected to a lot of accurate fire from light Infantry and artillery on the far left of the battlefield. This moment of resilience was crucial. 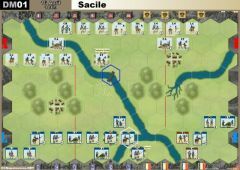 The French unleashed a deadly bayonet charge on their next move. On the left, a depleted unit was moved back behind the ridge. On the right, two line infantry units occupied the ridge. And on the extreme right, a somewhat impetuous charge sought to destroy a severely depleted Austrian infantry unit that had withdrawn to the second ridge. 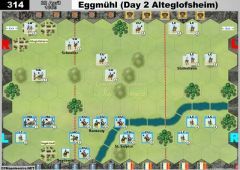 This depleted unit was destroyed, while two full-strength Austrian line infantry units were each reduced to two fifths of their initial strength.